A man named Dan who doesn't know anything about politics decides to run for mayor of his city; Shenanigans ensue. Grant Parker: Discomfort is the first pill to swallow on the road to change. Performed and Written by Tommy Banks Jr. 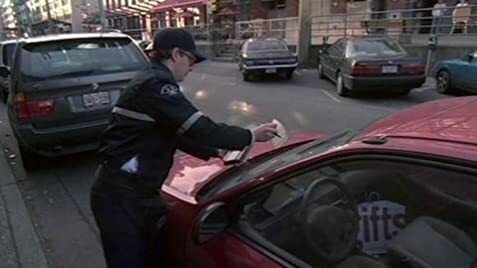 Under license from Tommy Banks Music Ltd.
'The Delicate Art Of Parking' is a funny movie. I know that much. Now, whether it will appeal to everyone is hard to guess. Filled with many Vancouver actors and Vancouver sets, it's first and foremost, in my opinion, a Vancouver movie. The other problem being. Since I used to do a fair bit of acting in my day, I know a lot of the actors that appear in this. So does that increase my enjoyment of it? 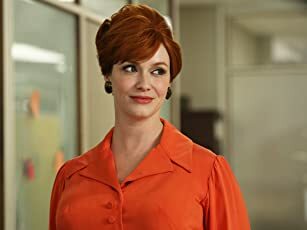 Probably not, while I enjoyed the people that I know, I also enjoyed the performances of the people I didn't know. Primarily the main character film-maker, played by Dov Tiefenbach and his subject played by Fred Ewaniuck. 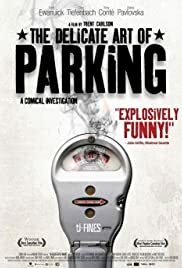 The film is a hilarious mockumentary about umm, parking meter attendants and the dangers of working on the job. I have no idea if that is true or not, but I'm sort of surprised no unions have protested the way they are presented in this film. Anyways, the filmmaker of this mockumentary follows this poor schlep around while he's working on his job, and is soon sucked into this mystery of how his superior was 'injured' on the job. The story is somewhat minor here actually, and the director mainly focuses on the characters mostly: How the director wants to get this documentary made so that he can repay his own parking tickets, the parking attendant's devotions to his friends, the divisional boss's secret desire for an acting career (and the director's ability to exploit it, making a 'video' for him as a ruse to get more information. All of these characters blend in very nicely in this world, which makes the clunky plot churn along.. The 'mystery' is somewhat aloof here, and there are some awkwardly paced moments, but all in all, a fairly enjoyable movie.